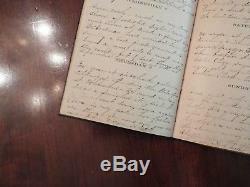 Civil War-dated journal handwritten by C. The journal contains Emmas ownership signature on the front free endpaper, 115 pages of handwritten journal entries, and dated between January 1 to December 31, 1864. 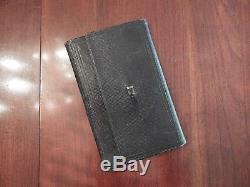 In addition, the journal is a Pocket Diary created by Denton & Wood in Cambridgeport, MA in 1864, contains leather boards, gilted edges, typical almanac pages at the beginning, several cloth bookmarks inside, measures 6 by 4, and in fine condition with only the closure on the front board absent and a small hole to the title page. 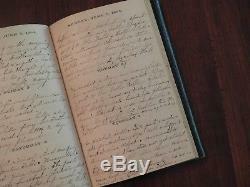 CIVIL WAR-DATED JOURNAL HANDWRITTEN BY C. EMMA GOODRICH, A PROMINENT OHIO WOMAN WHO OVERSAW HER FAMILY ESTATE AND RECORDED HER FAMILYS MILITARY SERVICE DURING THE WAR, DATED ENTIRELY IN 1864 AND CONTAINING 115 PAGES. Emma consistently throughout the journal reports on her everyday events, such as washing, ironing, cleaning, sewing, making apple butter and other apple products in the autumn; people coming to visit and a few deaths of friends and family, several as a result of military service; going to many houses and visits to her mother and grandmother before her death; and making several trips to Cleveland and some to Columbus. 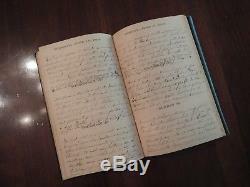 MAJOR HIGHLIGHTS OF THE JOURNAL INCLUDE EXTENSIVE DETAILED ACCOUNTS ON EMMAS BROTHERS MILITARY SERVICE IN THE 171ST OHIO INFANTRY REGIMENT AND CAPTURE BY CONFEDERATE BRIGADIER GENERAL JOHN HUNT MORGAN AT THE BATTLE OF CYNTHIANA. 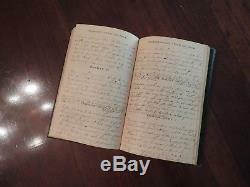 The major highlights of the journal include Emmas extensive detailed accounts on her brother Icks (Ichabod) and especially her brother Williams enlistment in the 171st Ohio Infantry Regiment. This includes the 171st Ohio mustering in in late April, initially performing guard duty at Johnsons Island, and later being sent in early June to Covington, KY where the regiment boarded a train to Cynthiana. Unfortunately, during their trip to Covington, William would be among the Union forces captured during the Battle of Cynthiana, led by Confederate Brigadier General John Hunt Morgan. On June 11, Morgan approached Cynthiana at dawn with a force of 1,200 men. Although a reinforcement of men from the 171st Ohio tried to repel the invasion, Morgan ultimately forced the Northern troops to surrender resulting in about 1,300 Union prisoners of war camping with him overnight. More than 2,400 men, a combined force of Ohio, Kentucky, and Michigan mounted infantry and cavalry, attacked Morgan at dawn the following day driving back the Rebels and forcing them to parole the prisoners. IN ADDITION, EMMA DETAILS THE OPENING OF AN OHIO FAIR AND INTERACTIONS IN CLEVELAND WITH MAJOR GENERAL AND FUTURE PRESIDENT JAMES A.
GARFIELD AND MAJOR GENERAL WILLIAM T. SHERMANS MARCH TO THE SEA. In addition, Emma details the organization of the Northern Ohio Sanitary Fair (whose purpose was to raise funds to assist soldiers) that was opened by Major General and future President James A.
Garfield and other interactions with Garfield while visiting in Cleveland. Emma also provides additional updates on General Morgan, including his death, and Major General William T. Shermans March to the Sea. 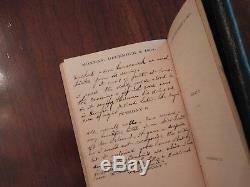 The following are historically important entries quoted directly from Goodrichs journal. Prisnel who was buried in Military-honor. I did not attend his funeral as I have a hard cold. We finished some linen baby aprons to send to the sanitary fair... Sister Maire & myself went down to Mrs.
Wadworths & carried the things down to send to Cleveland Sanitary Fair. We are making some Army shirts for brother Ick, who is to leave home on tomorrow morning. He has been to Warren today. He looks as if he had been ill a month, so kind of blue to think of war let alone having to go. Brother Ick will remain today at home = brother Will had to report at Warren. As yet, I do not know what he will do... Has prepared another Army blankets & other little nick-nacks for brother Ick. Little did we ever expect to assist in these things for war. Went down home to see how one darling Mother felt to have brother William gone. She was not very well but was looking quite as well as I had thought to see her. It seemed very lonely not see our brother Wm. But we cannot help it, this cruel war must come to an end. Brother Ick has come home. All are pleased to see him back. Brother had been up to Johnsons Island to see our brother William who had been quite sick. We washed & done our ironing besides done & real large baking & packed things to send to dear brother William by brother Hughes as he leaves us today in Company with Dr.
Applegate bound for Johnsons Island. He helped pack brothers things as they are ordered to Covington Ky. It seems hard to have brother go. & Sister Nancy & mother came up in the eve to hear from brother William. The news has been received that our 171st Regiment also another Reg. On their way South were captured by [John Hunt] Morgan & his men. Everybody is in a worry. All are excited & await the result with anxious hearts fearing the worst. News has come more particular concerning our dear loved ones gone to Ky. Brother we hear is safe, but others are killed. Brother William is safe & he sent a Needle case with its contents for us to see. A letter from brother W. Who had been in the midst of a Battle with John Morgan. The corpses of Miligan Early & Reed came in town this end. Think of what was to have happened four years ago today = Oh my dear cousin. War & when this cruel war is over! Earl are consigned to their long-houses. George Poley dead & his body brought home tonight. & also both Doctors arrived at midnight. Came up here very early to inform us of Brother Wm. Arrival home so we need noth send a dispatch for them to come home. I ironed & baked bread & biscuits & had good luck with it all. Newton Messenger was killed today in Mr. He is 19 yrs old. Today there has been two funeral sermons one of Mr. Holey & the other of N.
Brothers Andrews & Hughes attended the funerals. Lillie and myself rode up to the North-depot to see brother Will who is once more on his way to Johnsons Island, but he told me they were ordered to Maryland. I did not see him very long, just long enough to hand him a box & say goodbye, then turn around & cry. I saw Ephraim Millard at the Depot & some others on their way to Johnsons Island as yet the boys are not ordered away. We sent some honey & some bread & some cookies to brother William by Doctor Applegate. We remained overnight in Cleveland. I had quite time getting aboard the cars. I wonder I did not break my neck. Saw the financial Genl James A.
Garfield = he seemed pleased to meet us. I went down home to see brother William. He is from the hundred days on Johnsons Island & we are glad to see him. No news only good war news. A speedy close of this cruel war. Sherman is doing well in Georgia. Have received a very beautiful letter from Miss Smith of New Orleans. It gave a surprise as I could not recognize the writing but it contained good news, that my dear uncle & cousins are alive. I received a letter from Capt. Whiteman who is a prisoner on Johnsons Island. He informs me that cousin Dawson is well also all the family. 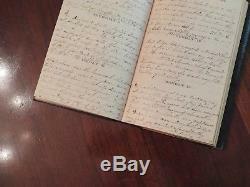 The item "Union Civil War Diary John Hunt Morgan & Battle of Cynthiana 1864, 115 Pages" is in sale since Friday, September 21, 2018. 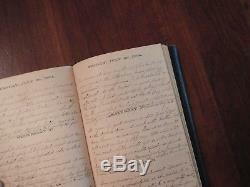 This item is in the category "Collectibles\Autographs\Historical". 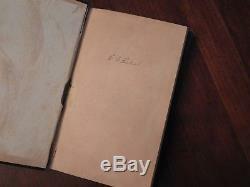 The seller is "grayautographs" and is located in Spartanburg, South Carolina.